The Best Books Ever: Emblaze Blog Tour: Interview, Review, and GIVEAWAY! 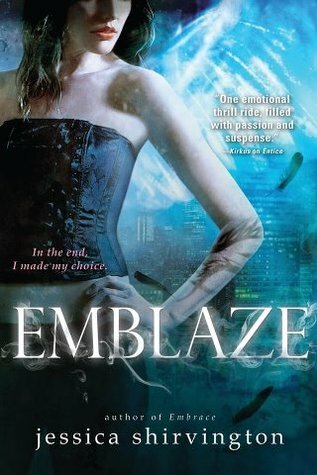 Emblaze Blog Tour: Interview, Review, and GIVEAWAY! Violet Eden has accepted that she’s part angel, part human—but nothing prepares her to be handed the key to the gates of Hell. Or worse, to be forced to turn the key over to the dark exile who saved and betrayed her: Phoenix. Violet and her partner, Lincoln, will have to stop Phoenix, but it’s hard enough fighting their soul-crushing need to be together. Violet begins to fear that the pull will soon become unbearable. As a brutal battle looms, Violet finds herself in dire straits as she teeters on the edge of a decision that could unleash a terror of horrifying repercussions. Will Violet's father ever find out about her true identity? I think it is safe to say you can expect a lot more from Violet's father in EMBLAZE and beyond. Will Violet and Linc get page time together in Emblaze? They will definitely share page time, both good and bad! Will we find out more history about Violet's mom (and perhaps other relatives)? You definitely will. In fact, the prologue is all about Evelyn - Violet's mother. Who was the most difficult character to write in Emblaze OR what was the most difficult scene to write? The most difficult characters to write are always Lincoln and Phoenix and for different reasons. Lincoln is so restrained that it is important to find ways for him to express his true feelings without being overly obvious. I always find his character takes extra time and care. In EMBLAZE there is a chapter from Phoenix's point of view. That took a lot of soul searching fo rme. I wasn't sure if I wanted to step out of Violet's point of view - if I even agreed it was the right thing to do - but once I did, that chapter soon became one of my all time favorites. And I realize now that the reason I had to do it was that the readers deserved to see that insight into the Phoenix no one - absolutely no one in the books ever gets to see. I saw that there are currently plans for 6 books in this series- why did you decide to break the trilogy pattern that seems so common in ya books right now. Why six books? 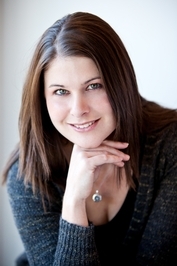 Jessica Shirvington is the author of the internationally acclaimed Embrace series. She and her husband of ten years, FOXTEL presenter and former Olympic sprinter Matt Shirvington, fell in love when they were 17. A finalist for Cosmopolitan's Fun, Fearless Female Award, Jessica lives in Sydney, Australia and is a full-time mom of two adorable girls, author and co-director in the company MPS Investments Pty Ltd.
Emblaze is the third book in the Embrace series. We catch up with Violet and the other Grigori pretty much where book two leaves off. The group has recently returned from their adventure in Jordan and Violet has some hard choices to make. After the shocking conclusion of book 2, many things about Violet were revealed and things got much more complicated for the heroes in this series. Pheonix plays a very large roll in this book. I have been on a rollercoaster with Pheonix. I loved him in the first book, hated him in the second book, and am leaning back into loving him for the third book. There is so much we still don't know about his character and he never ceases to surprise me. His humanity really shows in this book (as much as he hates that). Violet was strong in this book and made some really hard choices. There are non stop surprises and a ton of characters to keep up with, but the author handles them with ease. This is absolutely one of my favorite series and I can't wait for the next book! My only problem? I don't want to wait- I want it NOW!